By: Howard M. Wexler, Esq. and Skelly Harper, Esq. Seyfarth Synopsis: Court of Appeals for the First Circuit reversed the NLRB, holding that the Board lacked substantial evidence to find that the hospital group unfairly preferred nonunion workers when filling nonunion positions. Seyfarth Synopsis: The U.S. Court of Appeals for the D.C. 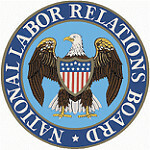 Circuit held that the National Labor Relations Board abused its discretion by ignoring its own precedent and downplaying threats made by pro-union employees during an election campaign where the union ultimately prevailed by a one-vote margin.